Early flight’s almosts and no ways. This flight of fancy, with its vibrating set of wings for propulsion, reminds me of the Japanese “bumblebee” fliers in H. G. Wells’ 1908 The War in the Air (tons of invention, badly written, with a lead character less of a protagonist and more an accidental point of view). Of course, the bumblebees were mounted and ridden like a flying motorcycle, where this is bigger and more conventional. “Flying mounts” rather than “flying carriages” have long appealed to us, as something closer to being winged ourselves, or at least riding Pegasus: they appear in 1827 in The Mummy! : Or a Tale of the Twenty-Second Century by Jane Loudon. 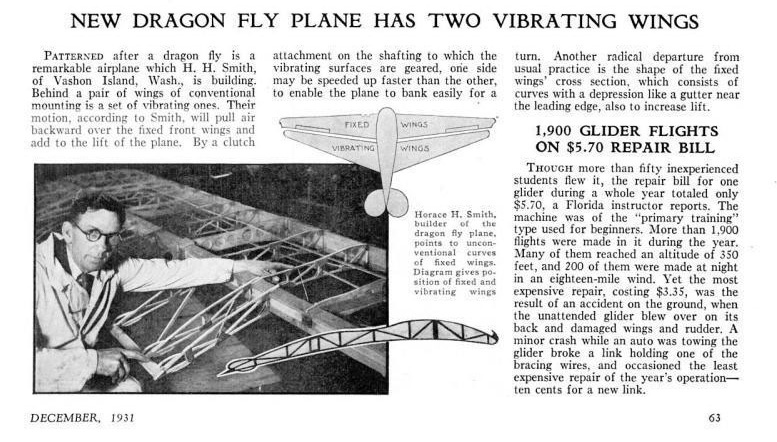 However, this one appeared in the December 1931 issue of Popular Science Monthly, p.63. Mad science had not deserted aeronautics after all! When I began work on my Failed Flyers project, I thought I’d be ending it about 1914. After all, you’d think that the aerial demands of the Great War would have knocked most of the silliness out of aeronautical designers. But no …. 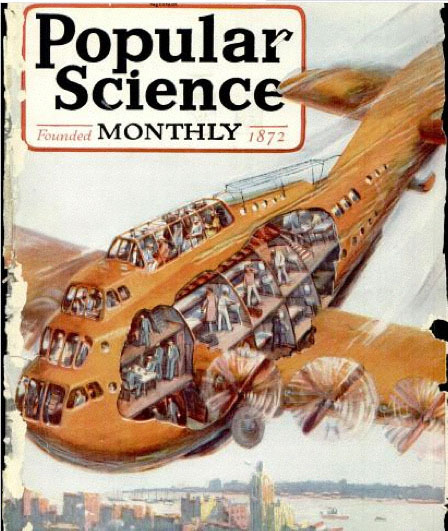 Thanks to the covers of Popular Science Monthly, and even more short articles inside, I find myself with no shortage of proposed, designed, but never built and flown aircraft on into the 1930s! In Failed Flyers, I include plenty of things that never got past planning, and this is one of them. In this case, we have the airliner of the future, “as pictured by Eddie Rickenbacker,” WW1 ace and now motor car company executive. If you think this is glorious lunacy (those tubby lines, really? observation deck like a train’s Vistadome?) or previsioning (multiple engines and room to walk around and a lounge like on a 747 or Concorde) you can see more in B&W pencil drawings at the article, here, on page 35.